Eggnog is a holiday favorite, and it's the best-known egg-based drink. Have you tried a Coffee Cocktail or a Ramos Gin Fizz? There are many great cocktails and mixed drinks that include a raw egg. Many of these drinks are classics, created in the golden age of the cocktail around the turn of the 20th century. Others are newer creations, often influenced by those old-timey drinks. Among these are the "fizz" cocktails get a silky foam top thanks to an egg white while other drinks call for the whole egg or just the yolk. Before we talk about how and why we use eggs in cocktails, we must address the number one concern with this ingredient: salmonella. Eggs can be one of the carriers of the bacteria. It is a very serious point to make, and there are ways to reduce your risks. However, if you are concerned or do not trust the options below, it's recommended that you simply avoid egg cocktails. Those people who are most susceptible to salmonella are the young, elderly, women who are pregnant, and anyone with a compromised immune system. A handful of non-alcoholic drinks include eggs as well, so these groups may also be affected and should also avoid these drinks. For the rest of us, we should be okay with drinking raw eggs, though there is never a guarantee. Countless drinkers have enjoyed hundreds of egg cocktails with no ill effects, but it's also important to be diligent in your egg handling. Buy Smart. Purchase eggs out of refrigerated cases only. Choose eggs with no cracks or damaged shells. Check the dates on the container. Another good sign of an inspected egg is the USDA stamp (or your country's equivalent). Pasteurized Eggs. Pasteurized eggs are available and a good choice for drinks because the pasteurization process is designed to kill any bacteria inside the egg. The drawback to using these eggs is that some of the flavors are lost. Pasteurized eggs will be clearly marked as such. Egg "Product." Another alternative is to use an egg product — essentially processed eggs that are sold whole or as whites or yolks alone. With these, you will notice a considerable taste difference, and most bartenders would not recommend their use in cocktails. Store Smart. You will want to refrigerate your raw (especially unpasteurized) eggs right away. Store them in the coldest part of your refrigerator where the temperature is 45 F or lower. Do not store them in the door (where those convenient egg compartments are most often) as the temperature there fluctuates each time it is opened. Also, keep the eggs in the original carton. If you do choose to use an egg product, it must be used immediately after opening. When in Doubt, Toss It. If an egg looks bad, has cracks, or in any way does not seem right to you, do not use it in a drink. When you crack the egg, if any part looks abnormal, discolored, cloudy, or (again) not normal, throw it away. Also, the USDA recommends that you store eggs for no longer than 3 weeks (sometimes stretching to five, though these would be best reserved for cooked food). If you have a question about whether your eggs are past due, give them the water test. For drinks, the ones that sink to the bottom are best, because they're the freshest. If the egg floats, discard it, as it is no longer edible. If you are a professional bartender, you need to check with your state laws before serving cocktails with eggs. Many areas prohibit serving raw eggs to customers. The U.S Food and Drug Administration and EggSafety.org have more information about egg safety. Mixing eggs into a cocktail requires a bit more work. This is because the density of the egg requires extra mixing to fully integrate into the other drink ingredients. Also, as we work with the egg, we need to keep in mind the safety steps we learned above. Dry Shake, Then Shake Again. Eggs are best mixed by shaking. To get the best froth (especially with egg whites and whole eggs), it is best to combine the drink ingredients in a cocktail shaker and shake it without ice. This is called a "dry shake." Then, add ice and shake the drink again. You will want to shake these drinks for at least 30 seconds, and quite often your arms will hurt afterward (it means you're doing it right). The point is to shake until you are sure the egg is fully integrated with the rest of the drink. Separate the Egg Safely. If the drink you are making requires you to use either the white or the yolk, you will need to separate it. It is important to keep in mind that the eggshell can have bacteria on it, so it is best to avoid separating the egg using the shell. 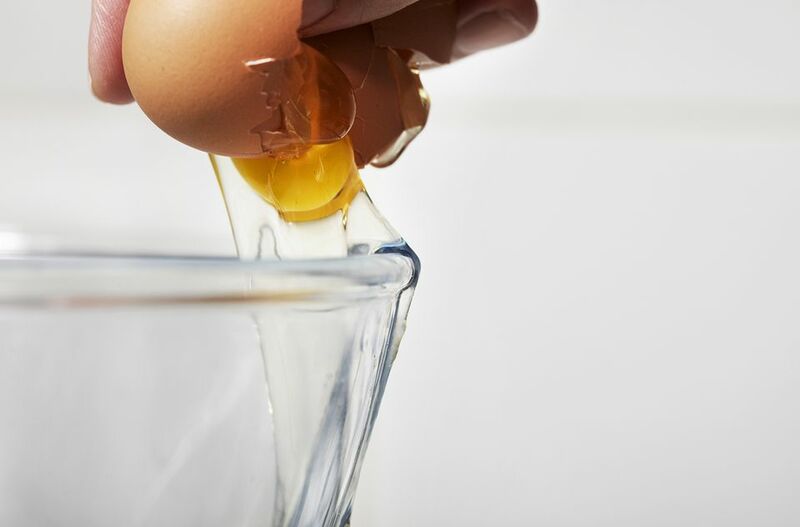 Pour the egg into a slotted spoon and allow the white to strain into a bowl or glass. Crack the egg into a bowl and use a spoon to remove the yolk. The trick is to not break the yolk. Use an egg separator. It's a handy kitchen tool that does all the work for you. Create an Egg Foam. While egg whites add a foam to cocktails, you can also make a separate egg foam to add to drinks. It is a fun, semi-advanced bartending technique that is very easy if you have a whipped cream maker (aka "whipper" like that from ISI). It can really make you look like a pro and adds a great touch to the top of drinks. What Do Eggs Add to Cocktails? There are three options for adding eggs to cocktails, and each recipe will specify which to use. Whole eggs and egg whites are the most common. Egg whites will have a very little effect on the cocktail's taste. They will add a nice rich, silky, foam texture as seen in cocktails like the Chicago Fizz. Egg yolks will add an 'eggy' flavor to the drink similar to eggnog. Yolks are rarely used alone, though essential in cocktails like the classic Night Cap. Whole eggs contribute the best of both worlds: egg flavor and a silky texture. If the drink recipe simply lists "egg," use a whole egg. There are a few distilled spirits that are dominated and characterized by the use of eggs. One common liqueur is the Dutch advocaat, and there is a German counterpart called Eierlikoer or German Eggnog. Other egg liqueurs can be found, especially during the holiday season and are often referred to as "eggnog liqueur." Essentially, many are pre-mixed eggnog, though you'll often find that homemade eggnog is superior. As you might imagine, egg cocktails have come and gone throughout the years. They have periods of popularity; then they seem to fall off into obscurity until the interest is renewed. Due to this, there is a great variety of old and new drink recipes to try. Among the oldest egg cocktails are those like the Brandy Milk Punch and Tom and Jerry. These are rather eggnog-like, comforting on cold winter nights, and holiday favorites. Then, you have classics that come out of the old cocktail lounges like the Clover Club, Commodore Cocktail, and Million Dollar Cocktail. Many of these were created by the best bartenders from the golden age of cocktails and remain icons in the bar scene. Sour, fizz, and flip drinks commonly include an egg as well. This includes classics like the Gin Fizz, Whiskey Sour, Pisco Sour, and the lovely Pink Lady. Taking inspiration from those are modern recipes like the Ginger Sour, Pomegranate Gin Fizz, Malacca Flip, Old Thyme Sour, Somrus Fizz and Whiskey Sour 101. Quite often, you can skip the egg to produce a perfectly fine cocktail with any of these. While many modern drinkers shy away from raw eggs in their cocktails, a number of mixologists love this ingredient. It's become a popular addition to new recipes because it brings in a classic style. There's also something irresistible about that foamy head. Many of these newer recipes are simply fascinating. You will find drinks like the Eucalyptus Martini, Aura In Me, and El Pepino to include the most intriguing flavors. Others like the Devil's Handshake, Polished Princess, and Look Better Naked Margarita are a little more approachable and universal to a variety of tastes. The creamy comfort of an egg is always a popular addition to holiday drinks. If you've found that traditional eggnog just isn't your thing, try a modern recipe that is filled with flavor but retains that egg cream.